No Oil for Pacifists: Did He Mean What He Said? Much ink has been spilled analyzing the latest stop on Obama's world apology tour: his September 23rd address to the United Nations General Assembly. The critics are right, for reasons already addressed here. Much also has been said about Obama's mention of Israel, focusing on the President's emphasis "that America does not accept the legitimacy of continued Israeli settlements." I think Obama overstates the case, particularly by failing to realize that "land for peace" has failed, so far. Still, a compromise remains possible--but only were there a moderate, moral and trustworthy leader who could negotiate for Palestinians, a potential I rate just south of the Easter Bunny and tooth fairy. The time has come -- the time has come to re-launch negotiations without preconditions that address the permanent status issues: security for Israelis and Palestinians, borders, refugees, and Jerusalem. And the goal is clear: Two states living side by side in peace and security -- a Jewish state of Israel, with true security for all Israelis; and a viable, independent Palestinian state with contiguous territory that ends the occupation that began in 1967, and realizes the potential of the Palestinian people. Gaza and the West Bank are geographically separate today. 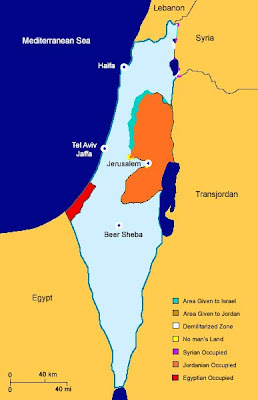 As ex-UN Ambassador John Bolton confirms, "Gaza and the West Bank were never contiguous Palestinian areas before." And, perhaps stating the obvious, connecting those regions would require slicing Israel in half. As even Palestine supporters acknowledge, this is a profound pro-Palestinian posture. Yes, Obama previously mentioned a "contiguous" Palestine. It remains radical, a-historical and wrong--and a rebuff of Israel only barely better than Zbigniew Brzezinski's. I cringe every time our Clown-in-Chief stands before an international audience and opens his mouth. The man NEVER says ANYTHING that advances the cause of the USA, benefits our allies, or promotes the merits of Western Civilization. The Leader of the Free World? Pffft. So, either Obama is so ignorant as to not realize that making a Palestinian state contiguous would require cutting Israel in two OR he's deliberately suggesting a 'non-starter'. In either case, neither ignorance or deliberately being disingenuous is encouraging. > but only were there a moderate, moral and trustworthy leader who could negotiate for Palestinians, a potential I rate just south of the Easter Bunny and tooth fairy. The Easter Bunny leaves eggs. The Tooth Fairy takes a tooth and leaves money behind. Both of these have legions of individuals who will indicate that these events have taken place. Now show me any evidence at all to support the existence of a moderate Palestinian!! Go on, I dare you. "Moderate Palestinian" does NOT belong anywhere in the vicinity of comparatively near-proven things like The Easter Bunny or The Tooth Fairy. PFeh! Obama says contiguous, so he must mean give back the west bank. Or the other part. Take your pick Arabs. Good point, Bob--and since they already have Gaza, game over. It's obvious to me that the Palestinians will never create a viable state -- or anything else. Their focus is simply NOT on building or creating. Nor will they ever be independent, because they're totally committed to victimhood and retribution -- they have no psychic energy left over for the long, boring slog of nation- or economy-building. But back to the text of Obama's speech: ain't no possibility, nohow, no way, of a "viable" and "independent" Palestinian state. Just like with Iran and North Korea, we're treating hostile savages as our moral equals. We're naive to think that we have values and ideals in common, and ultimately we're deluding ourselves that our nuanced diplomacy can persuade them to give up their dreams of expansion-by-conquest.